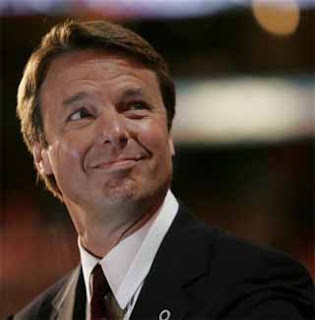 John Edwards' campaign has announced that he will quit the presidential race from a speech this afternoon in New Orleans - the same place he started in 2006. Despite his white, white teeth - he was outshined by Obama and Clinton. I respected him for his consistent focus on poverty in America, although sometimes the rhetoric of "two Americas" sounded more like he was encouraging a new proletarian revolt. It's almost a ludicrous argument - 'How long are we going to stay?'" 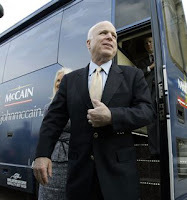 McCain insisted to me between campaign stops in Florida's panhandle. "It's like asking 'How long are we going to stay in Japan?' Well, we've been there since World War II." This is typical of McCain - he calls it like he sees it instead of resorting to political rhetoric. No political political communications director in his right mind would let his candidate say that right now. And as much as I don't like to hear that about Iraq, it makes me wonder if it's just true, as bitter as a pill it is to swallow. President Bush's State of the Union speech was Monday night. The events still gives me goosebumps (I'm such a political nerd). It was his last one. If you missed it, you can read it, see the eight main points, or just the biggest words. Most interesting thing to me? His threat to veto to stop congress from adding "earmarks" that haven't been voted on.